1.Material: Carbon steel/alloy steel/stainless steel. 3.Surface finish: polishing, mirror polishing, powder coating. 1.Casting facility: wax injector, medium-frequency induction furnace, box resistance furnace, heat treatment furnace, flame cutting machine, shot-blasting machine, sand-blasting machine. 2.Machining facility: CNC,NC lathe,ordinary machine tools,NC milling machine, polishing machine. 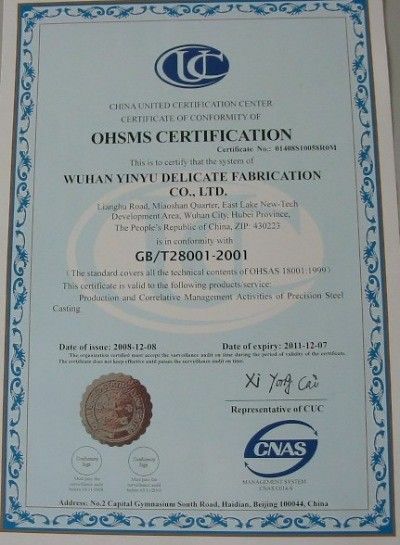 Test facility spectrometer, tensile test machine,impact tester, hardness test machine,CMM. 1. Are you a manufacturer or trading company?Do you have your own factory? We are a professional manufacturer with over 8 years’ export experience for designing and producing.Yes, we have two of our own factories. 3. 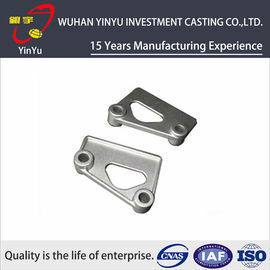 Do you provide customized parts? 4. Can you make castings based on our sample? 5. I can’t see the goods or tough the goods,how can I deal with the risk involved? 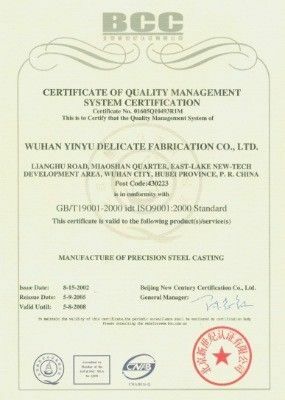 We are 6 years Gold Supplier of Alibaba.We have established the quality management system conforming to ISO 9001:2008.We are absolutely worth your trust. ......More questions welcome to contact with us.